A LIMERICK supermarket has made annual savings of €22,000 by investing in green technology and in the process, has donated more than €9,000 to St Mary’s Rugby Club. Garvey’s SuperValu in Corbally is leading the charge in energy conservation following a significant investment in energy upgrades to their store, which has greatly reduced their carbon footprint. The supermarket invested heavily in the installation of new, more energy efficient, refrigeration units with doors. This store upgrade brings down the cost of their energy bills by €22,000 year on year. 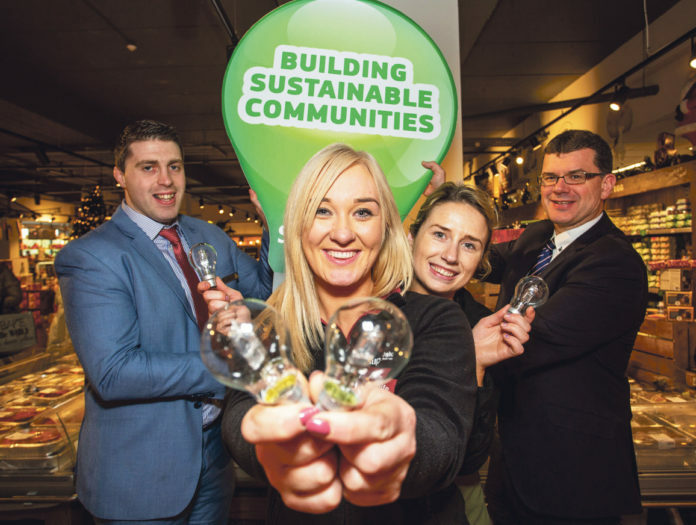 It was all part of a wider community suitability scheme in association with the SEAI (Sustainable Energy Authority of Ireland), which saw stores such as Garvey’s SuperValu join in the initiative to build sustainable communities around Ireland. This national retrofit programme upgrades store and community buildings and facilities to meet high standards of energy efficiency and renewable energy usage, with an aim of reducing energy costs, fossil fuel usage and greenhouse gas emissions. Garvey’s chose St Mary’s Rugby Club as their community cause to partner with on this programme. As a result, the club received over €9,000 for energy upgrades to their own facilities. They chose to upgrade their installation and lighting, funnelling money back into the club through reduced energy bills, and also resulting in better conditions for players and coaching staff. Jim Garvey, Owner SuperValu Corbally said; “Energy efficiency is a term that we are becoming more and more familiar with and, to me, it makes sense. We look at our customers as friends and family, and we want to look after them as best we can. “By fitting new refrigeration in the store, we’ve already seen our energy bills reduce significantly and at the same time we are generating energy efficiency awareness among our customers”. “We wanted to give back to our community and with our donation to St Mary’s Rugby Club, we hope that not only will they be able to continue providing a healthy outlet for our community, but also continue to become more energy efficient like ourselves,” he explained.